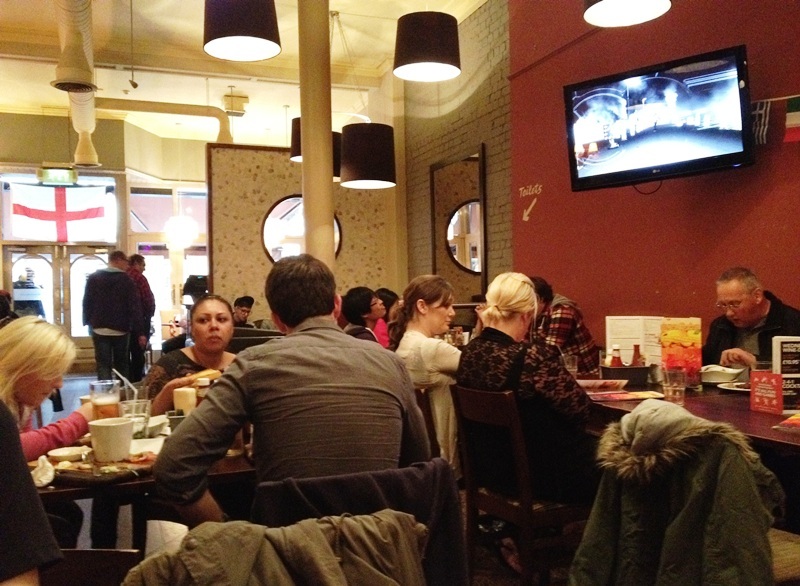 This restaurant has a presence in almost every English city. Surprisingly, we always took it for granted and never really got to trying it out in our years of living in the UK. We decided to give a shot for the 5pm England's opening game against France in the Euro 2012. Unfortunately, we were unable to do the booking on the same day itself, so we decided to pop in to the restaurant early to grab us a good table to enjoy our dinner with hopefully some good English football on display. Much remained to be said about England's performance on their opening game against France. With national pride at stake, we had hoped for a better performing young and transformed English team. 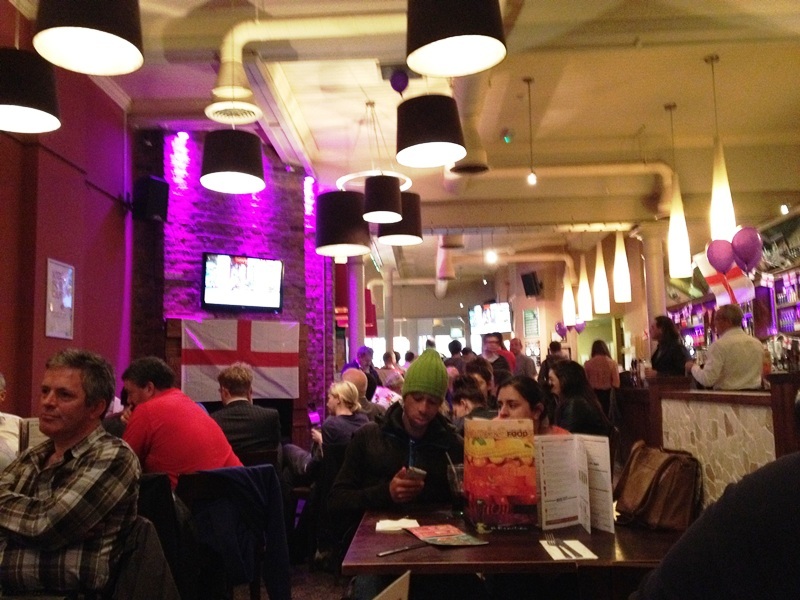 Dressed in the England's Euro 2012 kit, we marched with great anticipation to Slug and Lettuce! As the national anthem 'God Save the Queen' played in the background, we showed our due respect by not tucking into the food as yet. As soon as the game got going, our stomach engines started working too! 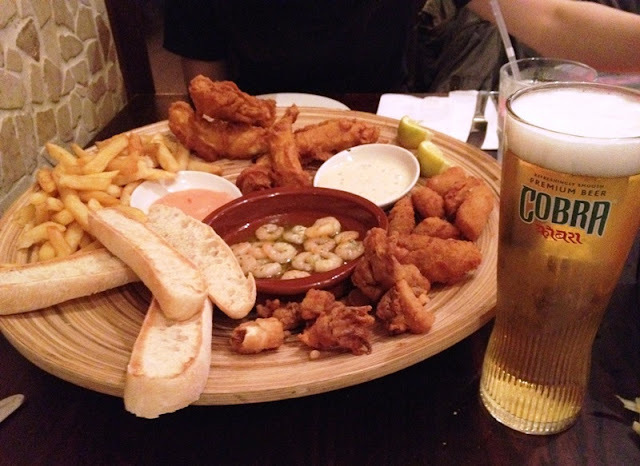 Spoilt for choice, we decided to go for a sharing platter, and here we go! There was British wholetail scampi, sauteed king prawns in garlic butter, calamari, and haddock goujons, served with chips. Accompanying sides included ciabatta bread strips and garlic Marie Rose and tartare sauces. The guys across at the neighbouring table stared in disbelief when the waitress brought the above massive rattan plate to our table. The first thing that struck my head was 'Oh my gosh, there goes my dieting for summer-beach body' as the plate of fried food returned my stare with a big 'EAT ME' sign. (+) Haddock goujons were fresh. Very crispy batter with tender white fish meat, no 'fishy' stench. (+) Scampi was done the way it ought to be, slightly mashy on the inside with crisp surface. (+) Ciabatta bread strips dipped with the garlic butter was definitely sinful but we just could not stop. (+) The garlic Marie Rose sauce was quite a dip, highly recommended. (-) Calamari rings were rather small in size, not sure if it was the cut or it shrivelled upon frying. Half-time: We were struggling to finish the food, but somehow the boredom of watching the football game kept us going and it was gone by half-time. We had 15 minutes of break for our stomachs as the football players received their lecturing in the dressing room. By half-time, the scoreline was a tie at 1-1 with Lescott netting England's first goal in the 30th minute and France reciprocated promptly with Nasri's cracking long-shot in the 39th minute. Frustrated with England's performances, especially with France coming back shortly after Lescott's goal, some supporters and diners left..but still there was quite a crowd of diners around! Like the name suggested, this was a cookie biscuit base, filled with chocolate brownie, marshmallow pieces and chocolate honeycomb, served with vanilla ice cream. (+) Brownie chunks were moist and warm and went very well indeed with the rich creamy vanilla ice cream. (+) Cookie biscuit base was soft and 'malleable', unlike the crisp 'biscuit-like' hard texture. (+) The chocolate honeycomb and the soft mashed marshmallows gave a very rich 'gooey' taste. 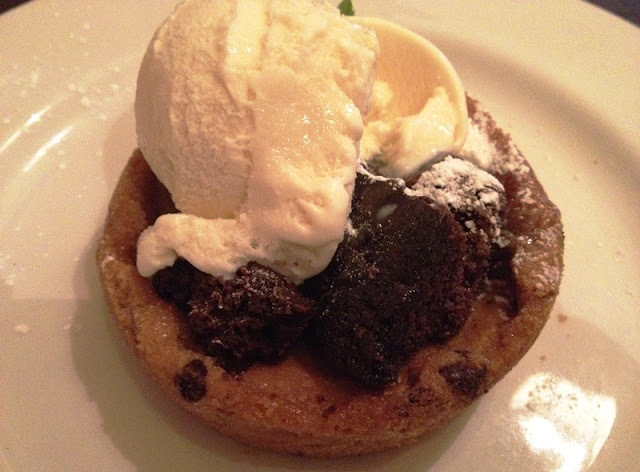 (+) Particularly enjoyed a 'section' of the brownie + cookie + ice cream where there was a piece of sweet basil leave left to infuse the fragrance and tinge of freshness. (+) A very interesting and unique selection of sinful and devilish treats, calories well worth though! (-) Was expecting some chunks of marshmallow pieces, but it was barely visible. (+) Similarly served with vanilla ice cream, you could see how smooth, rich and creamy it is in this picture! 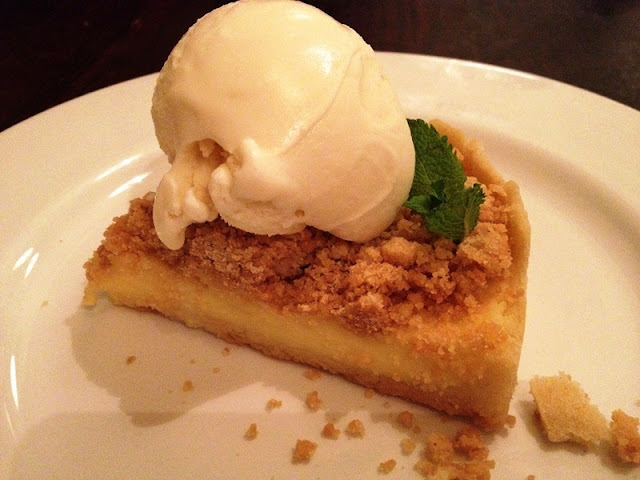 (+) Great insertion of a lemon cremee ayer between the crumble and base of tart. (+) The 'tart' itself was very rich in butter, albeit a good sense. The 2nd half on my plates was more interesting than what was on display between England and France. The desserts most certainly concluded our dinner well, though we would cringe at the thought of the calories digested...full platter of fried food, beer and two desserts. Hmm..I would not think it bode too well for our summer diet, but hey what better way to support England than to take some English pub food while watching the game? Oh and while limelight was all being cast upon the food, let us not forget that England had still not won in their opening game before in Euro, and the game ended 1-1.